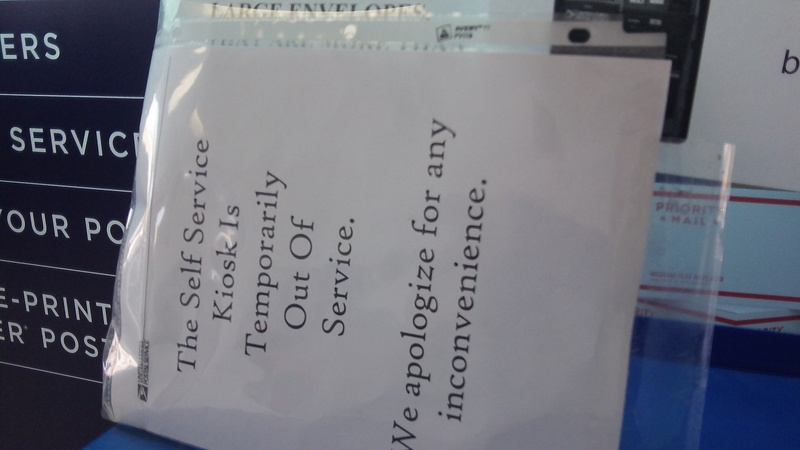 The sideways sign claims the self-service outage is temporary. In early 2014 the inspector general of the U.S. Postal Service Office issued a report that the system’s 2,500 self-service kiosks were used not nearly as much as the service wanted. It blamed several factors including inconsistent signage and poor location in postal lobbies. In Albany, where the kiosk is placed where you cannot miss it, the more likely reason is that too often the machine does not work. I’ve wanted to use the kiosk in the Albany Post Office lobby twice in recent weeks, both times when the office was closed. The first time, as I reported on June 25, the kiosk completed a debit card transaction but then refused to disgorge the postage. The second time, Tuesday night, I watched a guy try to mail something until he gave up. The card reader would not read his card, and after he had tried several times and then put his card away and left, the screen still urged onlookers — me, by that time — to remove the card. I took a closer look. There’s a sign warning customers that the card reader is very sensitive, and to leave the card in the slot until a green light comes on. Evidently the opposite is true. It’s not sensitive enough to sense and read a card that’s in the slot. There was another sign, taped sideways at the top of the machine where customers would not see it right away. It announced that the thing was temporarily out of order. Temporary? As far as my experience goes, the kiosk struck out twice in a row. Self-service kiosks seem to work flawlessly at the only other places where I often use them, at the bank and at the Albany Fred Meyer store. How come the Postal Service can’t manage the same? As I mentioned before, the machine stole a bit of money from me a few months back, and I have not used it since that time. Prior to that, I had used it frequently. But once burned by a technology (or business usually) , I will avoid it from then on. I must agree that the machine does not give good service — and as there is no one there to help you you’re out the money. For a large sum, folks would come back to the post office to get their money back, but for less than $2 it’s not worth the time. This machine is in contrast to the personnel at our post office, who always give me great service. So I will continue to deal with humans. At this rate, the scale on the machine works properly, and doesn’t require a card. So one can find out how much postage to put on. So for me an alternative solution would be to bring back the old ‘mechanical’ stamp machine they had, which did not take my money, and with an accurate scale, I can just figure out what I need and buy the stamps using the old techology. I doubt this will happen, but I would love to see it. It’s acceptable to roll back to old tech when new tech fails. Meanwhile, during normal operating hours, the Carriage House Plaza Post Office is very quick and handy…offering other services, like a copy machine and packing peanuts, among other things. Always friendly with short lines. That old stamp machine Shawn mentioned above always worked. I used it many times. Sometimes technology fails us and that kiosk downtown seems to fail often. going on a year now. Where’s the evidence indicating supervision actually moves the needle. Ah, I did not know that. Thanks Jim. It would be nice if those self service machines would take cash. I don’t see the point of using a card for small purchases like stamps. Then at least you could still use the machine when the card reader doesn’t work. As for not printing printing postage, you might want to check the slot where they come out because sometimes they become folded and get stuck in there, but you can still pop them out most of the time. 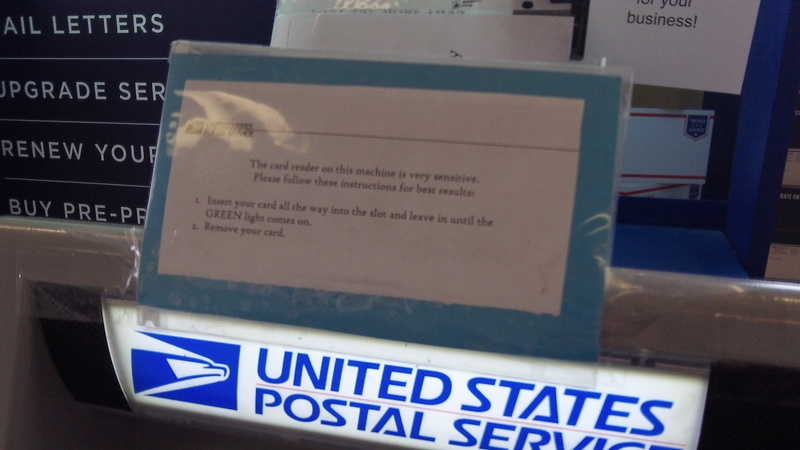 The priority mail supplies don’t seem to be well stocked at the kiosk either. Granted, there is no way to deter people from grabbing most of the popular sizes with little regard to others. I must say the Albany Post Office personnel are amazingly attentive, efficient, and friendly in an environment of labor cost efficiency(not enough workers to meet demands) that leads to long lines of people that include both patient and impatient customers.